I had an 'internet issue' last week when around 10am my connection to the internet was lost. Well not completely lost - my work PC (a remote box accessed via VPN) was still working fine so I still had a connection (at an IP level), but I couldn't visit any websites. The problem was that Pipex's DNS servers were offline (I couldn't ping them) and it wasn't planned maintenance. 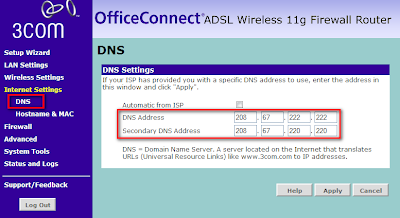 More detailed setup instructions can be found on the OpenDNS site. As my ISPs DNS failed last night I think I might give this a go. Couldn't try it last night as I could not get on the internet ! Made me think that I might print off a couple of options.